I recently watched a dove take its first flight. The nesting parents had found a location away from neighbouring cats in not the most secure location, on a piece of wind chime art I had made, where mother and egg swung precariously for two weeks. After carefully not disturbing the nesting, where I walk five times a day, the egg then hatched. 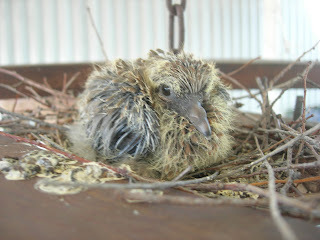 The hatchling slowly grew in size and strength leading up to the moments of its first flight. This momentous event I watched for two hours intently. A rare opportunity. The dove gradually stood, shuffled to the edge of the structure to stretch its wings and practiced launching. After a hour of stretch and pause a trial hop was attempted, just a couple of feet between footholds. Then the mother reappeared on a nearby tree and cooed loudly. With a great flapping of wings and nervousness the fledgling leapt into space and clumsily joined its mother. The next flight was to the empty field next to my house, where eight more new doves were feeding on seeds. Then ... it was gone. It made me think, what makes us leave the nest? It is not the shock of denial and negation. The strength and encouragement of love is a much greater force. The dove did all things necessary to prepare for the flight and eventually leapt with the encouragement of its parent. This combination of preparation and encouragement seems so logical, yet how often do we overly protect and 'do for' others, and in doing so fail to do what is needed to enable them to survive. I think often about the responsibilities that will befall Generation Y in their heroic quests we have left them. Have we prepared them for the flight, or just kept them safe, nurturing in protection of predators? Will they learn to fly, and at the same time , not too high?